Brian was one of the most interesting parishioners I have ever served. A blue collar guy in a community and congregation of the wealthy, Brian often turned heads. He’d come roaring through the parking lot on Sunday morning on his big Harley, black boots, black jeans, black leather jacket, long streaming blonde hair and beard. He’d park the Harley next to the wide portico leading to the entrance to the church, and before shutting the engine off, he’d give it one last twist of the accelerator, making sure the loud roar of the engine reverberated under the cover of the roof, startling those poor souls who somehow hadn’t noticed his arrival. Years earlier, Brian had been on the street for a while, his life a mess as a result of alcohol and drug addiction. By the time I met him, he had found sobriety and was making a good living working in his father’s manufacturing business. He was an odd evangelist, but evangelist he was, telling everyone he knew — and often those he didn’t — about how Christ had turned his life around. He’d often bring new friends with him to church, sometimes guys, sometimes his new girlfriend. When Kristy (not her real name) started coming with Brian, her presence turned a few heads. Her dresses were quite a bit shorter, her heels quite a bit taller, and her hair quite a bit more dazzling than what we were used to. Turns out Kristy was a dancer at a gentleman’s club (an oxymoron if ever there was one), and Brian was trying to rescue her from that life and get her a “real” job. She came with him pretty faithfully. I had a few conversations with them about church and Jesus and getting on the right track. Kristy decided she wanted to be baptized; I was never very sure whether it was something she really wanted to do or something Brian was pushing for her to do. I’m guessing it was some of both. She showed up that morning in her Sunday best — actually her Saturday night best. Short skirt, tall heels and a top with a deep v-neck. It was quite a thing to have to decide where to have Kristy stand as she bent over the font to be baptized, a choice between having the congregation look up her skirt or down her sweater. Made me long for the old days of baptismal gowns. Regardless, it was a day of great joy and celebration. We didn’t do a lot of adult baptisms. And we didn’t do a lot of baptisms where the contrast between the life behind and the baptismal life into which Kristy was being born was so sharp. We didn’t see Kristy much longer after her baptism. After talk of marriage, Brian and Kristy suddenly broke up. Brian didn’t want to talk about it. I’m not sure what happened. She came a few weeks by herself and then nothing. When I asked, Brian told me she had moved back north, went home, he said. I’ve always wondered what happened to her. Did that short connection with the church mean anything, have any impact at all on what came later? 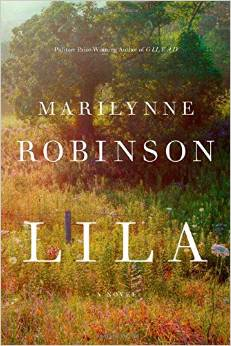 Kristy came to mind as I’ve been reflecting on Marilynne Robinson’s latest novel, Lila. Once again the story takes us back to Gilead, Iowa and to the characters we’ve already met in her previous two novels, Gilead and Home. In the first two novels, we encounter Lila as the young wife of the aging minister, John Ames. Now, we learn her story and the unlikely meeting and marriage of John and Lila. Lila is born into a family on the very edge of survival in depression era middle America. She is taken from that family of neglect and abuse to be cared for by Doll, a loving and resourceful drifter. Doll is the only one she can trust, the only from whom she experiences love. They are virtually inseparable until Doll runs into trouble and lands in jail. Lila then has to fend for herself. While living in an abandoned shack on the edge of Gilead, she comes into contact with Rev. Ames, his church and the members of his church. What commences is an extraordinarily odd courtship and marriage. Only gradually does Lila come to know love; only gradually does she come to trust her husband and the church people around him. Constantly fearful of abandonment, she doesn’t even trust herself to stay, wondering when she will walk out the door with her baby and return to the hard life of a drifter. Robinson captures so poignantly the cautious entry into the church by one who has learned to be suspicious of the church and church people. For those outside the church, and maybe especially for those on the edge of survival, the church can be a place to be afraid of, where those who desire to do good end up doing harm. There’s a scene when Doll temporarily leaves the loose group of itinerants, saddling them with one more mouth to feed. When they decide they can’t keep Lila, they abandon her on the steps of a church; there she is most afraid that church people will “steal” her away from Doll and that she will never again see the only one who has really cared for her, difficult though that life may be. We get ringside seats into Lila’s struggle with the theology of exclusion so associated with the church. In particular, Lila simply can’t accept a God who would leave Doll out of heaven. Though she never got connected to the church and never was “saved,” it was Doll who saved her. We also get to see how Lila grows into the love of her husband and to some strange peace about her own part in the church. There is nothing fancy about their lives. Their love is deep, yet imperfect, hers seemingly tentative, as if that’s the only way she knows how to love. By the end, Lila seems to relax into the love of both her husband and her husband’s God. Which brings me back to Kristy, to wondering what ever became of her. I know that wherever she is, she is still in God’s embrace. I just hope she has found a community that keeps on reminding her of that. This entry was posted in Uncategorized and tagged church, evangelism, exclusion, Lila, love, Marilynne Robinson, misfits on January 22, 2015 by Jim Honig.